The Edge Films is presenting the On the Edge Film Festival, Cleveland's first adventure, extreme sport, environment, and culture film festival this year! We've hosted the Banff Mountain Film Festival World Tour here for nearly 15 years - now it's time to launch our own festival in the city that's becoming known as a mecca for independent films! Get ready to be entertained, awed, and inspired when these films hit the big screen. ​A story of some good friends doing what they do best: having fun, adventuring, and sending it on mountain bikes and kayaks. With the idea to run their bus to be more economical as well as environmentally friendly, the friends converted the school bus to run off waste vegetable oil. 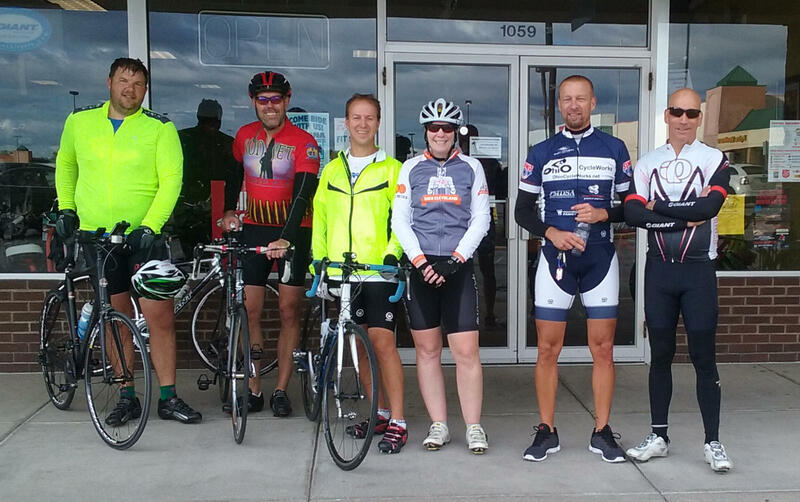 The National Bike Challenge pits bicyclists around the country in a friendly competition. Riders log each bike ride they take, earning a point for every mile ridden, plus 20 bonus points for every day you ride a bike. 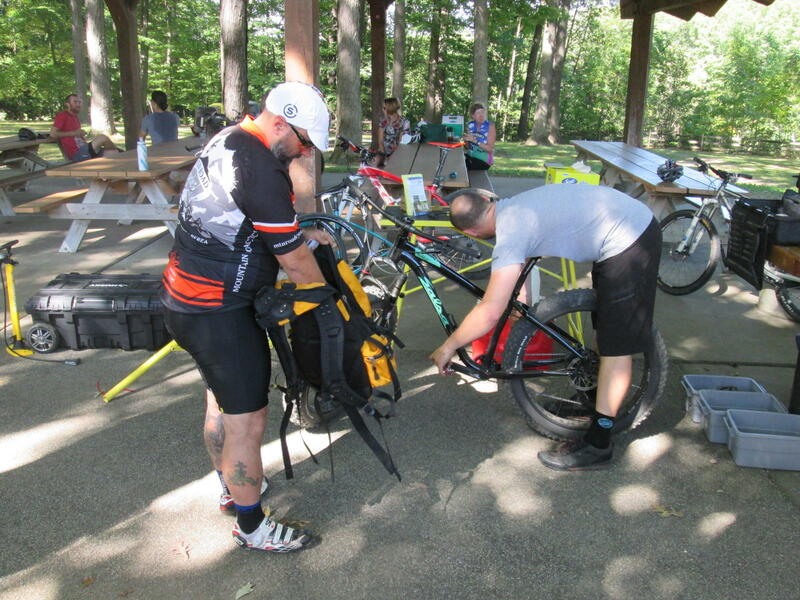 A local challenge is sponsored by Bike Cleveland and Bike Pittsburgh, with cyclists in both cities seeing who can rack up the most miles in the Rust Belt Battle of the Bikes. Pittsburgh took the title in 2013, but we Clevelanders rallied to bring the Rust Cup to Cleveland in 2014. Who will capture the Rust Cup for 2015? We'll find out soon! On September 21, People for Bikes, the organizers of the National Bike Challenge, announced that we had reached their nationwide goal 10 days ahead of schedule -- 35 million miles biked and logged across the USA! Click here to read the full article. 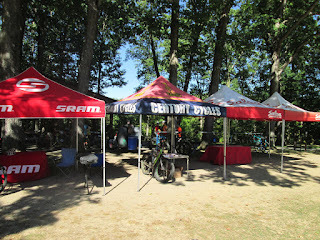 Thanks to everyone who came to the Cleveland Metroparks Bedford Reservation on Thursday for the Salsa Cycles Demo Day! It was a perfect day, with beautiful weather more typical of southern California than Northeast Ohio, and the mountain trail was in perfect condition for riding. We were so busy that I didn't have time to get as many photos as I had hoped, but that's okay! We had riders of all types, from experienced mountain bikers, to those on their first time riding in the dirt. Doug and I enjoyed leading a couple of beginner groups on part of the Bedford Singletrack, and I think we may have earned a few converts! If you liked what you saw and rode, remember that Century Cycles has a number of Salsa bikes in stock in our three stores, including a few 2015 models, that have been marked down, like the Bucksaw and Mukluk Suspension! We've also got a few of the 2015 Vaya 2 and Vaya 3, two of the most popular touring bikes, available, and a 2015 Fargo 2 - the Tour Divide-winning off-road touring bike! 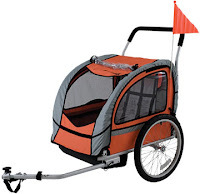 New 2016 Salsa models are arriving daily. We now have the 2016 Vaya Deore and the 2016 Fargo X7. On the way are the Marrakesh Drop Bar and Beargrease X5! 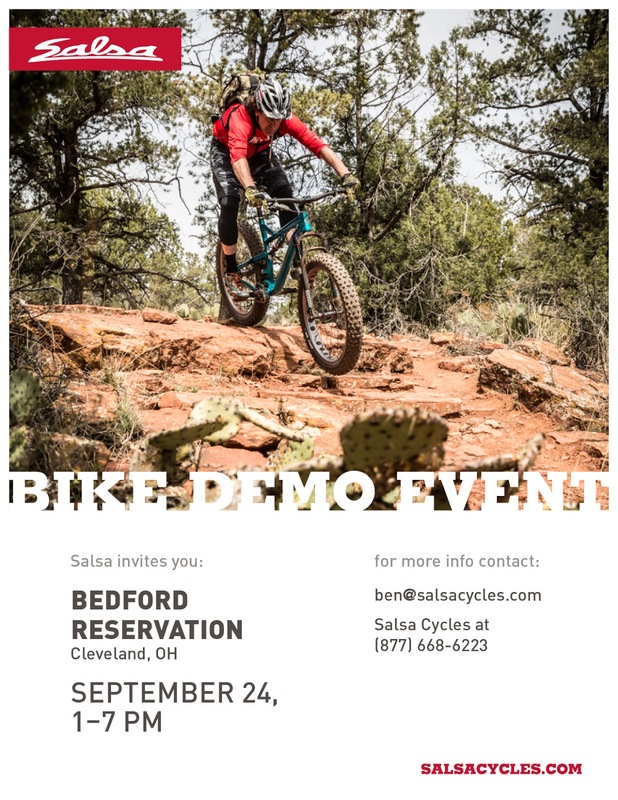 Thanks to Salsa Cycles for bringing their demo fleet to Cleveland. Look for the Salsa demo van to come back in the spring of 2016! "What began as a rather chilly morning quickly turned into a comfortable morning for a ride. We started out with seven people total on our ride. This photo is an after-ride shot. We decided to take a more challenging, hilly route and headed out Granger Rd to take on some hills, rollers and progressive slow inclines. Twenty miles total. That was enough after the hills!" It must be orange barrel season on our local trails! 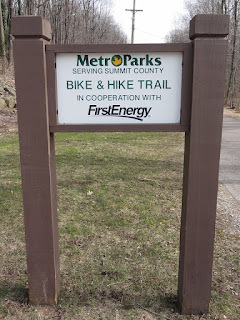 In addition to the Towpath Trail closure that we mentioned yesterday, we have just learned that a section of the Summit Metro Parks Bike & Hike Trail will be closed for the next two weeks for re-paving. From Boston Mills Road, south to the new tunnel at State Route 8, the trail will be closed for approximately two week. This includes the parking area at State Route 303. Towpath Trail Closure - Visitor Alert - The National Park Service (NPS) will temporarily close the Ohio & Erie Canal Towpath Trail in Cuyahoga Valley National Park (CVNP) from Red Lock Trailhead to Frazee House Trailhead from Thursday, September 24, through 5:00pm, Friday, September 25, 2015. This is an approximately 5.2 mile closure and includes the Station Road Trailhead near Brecksville. No detour is provided. The closure is needed for resurfacing portions of the Towpath Trail. CVNP asks that you please respect the closure and plan your visit to the park safely by using different sections of the Towpath Trail during the construction times. For more information visit www.nps.gov/cuva or call 330-657-2752. After 14+ years since the founding of the Cleveland Area Mountain Bike Association (CAMBA), it’s only appropriate that they've finally announced the first public trail day for new mountain bike trails in the Cuyahoga Valley National Park! All the heavy work for Phase I of the East Rim Trail has almost been completed, thanks to Spectrum Trail Design and the National Park Service, so volunteers are needed to assist with all the finishing work. If you don’t have experience with trail finishing work, no problem … other volunteers there will be glad to show you, and will have all the info and tools to help. Where: Meet at the trailhead parking lot on Boston Mills Road near where the Bike & Hike Trail crosses (Google Maps link). Lunch will be provided at noon. Any amount of help is welcome, to get this trail DONE so we can start riding it! Major thank yous are due to the Conservancy for CVNP for their diligent efforts to procure the necessary funding to get this project going! Also big thanks to the International Mountain Biking Association (IMBA) and Clif Bar for their annual donations to help sustain trail days. Upcoming Volunteer Orientation sessions can be found here. More sessions will be available as the season progresses, and updated to the site (though attendance is not required before trail work with CVNP or the Conservancy). Stay tuned for future trail days this fall! PLEASE NOTE: Effective immediately, our Extended Summer Sunday Hours at the Century Cycles store in Peninsula have ENDED for the season. 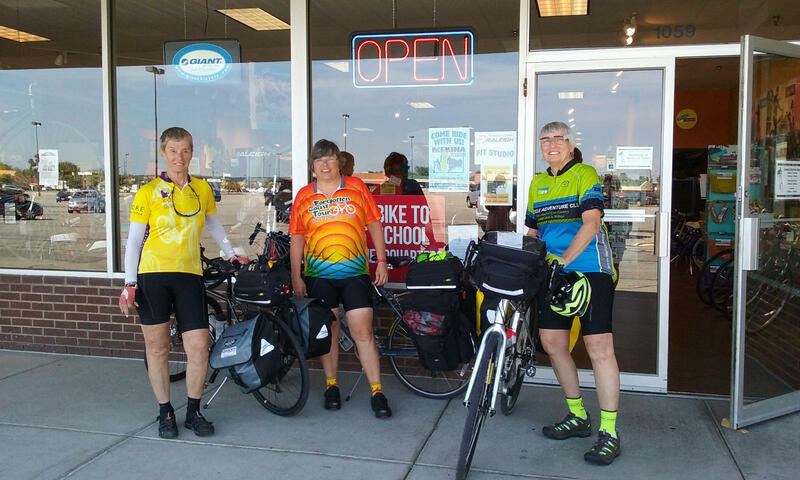 On Tuesday, September 15, 2015, Marnie Rawles, Judy DeSantis, and Miriam Joscelyn stopped by the Century Cycles store in Medina. These ladies are from different parts of the United States and met through the Bicycle Adventure Club. It was a delight sharing stories with them! 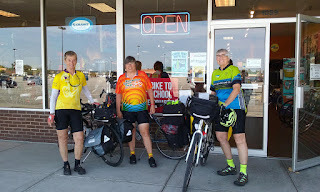 You can see more photos of bicycle touring travelers who have visited all three of our stores in our Bicycle Touring Photo Gallery. The 2nd annual NEOCycle is now history. Although we weren't quite as lucky with the weather as we were for the first NEOCycle last year, there were still plenty of opportunities for cyclists of all ages and abilities to have a good time. After hearing about what a great time the Night Ride was last year, my girlfriend and I decided to plan ahead, and we pre-registered for this year's Night Ride, as well as the MCPc Fundo. Saturday afternoon came around, and with it came a steady rain. As the day wore on, rather than clear up, the rain continued even harder, so we decided not to bother leaving home for the event. From the reports I heard and saw, it looks like we made the right call. Sunday morning, there were dark and threatening clouds, but the streets and the sky were dry, so we loaded up the bikes and headed up to Edgewater Park. The smooth check-in process (including picking up our t-shirts and lights from the Night Ride) went pretty quick, and we were soon off on the half-metric century route. There were some pretty stiff winds out of the north coming off Lake Erie, but it stayed dry all day, and the sun came about about halfway into the ride, making for a beautiful day. We thought that the route of the Fundo was a big improvement over last year's route. There were fewer left turn across traffic, and we avoided more of the major high-traffic areas, while still seeing a great cross-section of our wonderful city of Cleveland. This year's route also took better advantage of the city's growing bike infrastructure. The snacks at the rest stops were delicious, especially the smokies on the Morgana Run Trail in Slavic Village! Thanks to the Greater Cleveland Sports Commission, Cleveland Metroparks, Bike Cleveland, and the scores of volunteers, exhibitors, and sponsors who all came together to make this event happen. Looking forward to NEOCycle 2016! Come and test-ride some of the latest bikes from Salsa Cycles! We'll have the Beargrease, Blackborow, Bucksaw, El Mariachi, Mukluk, and Warbird, all in various sizes! Bring a photo ID and a major credit card to be able to demo bikes. Bring your own helmet, and you can also bring your own cycling shoes and pedals to be swapped onto the demo bikes! Continuing their introductions of new products for the 2016 season (which began with the Japanther cool weather cycling shoes a few days ago), winter cycling specialists 45NRTH have announced the details of their flagship Wölvhammer winter cycling boots. Completely redesigned for this model year, the 2016 Wölvhammer retains many of the functional elements of the original boot while improving design and style. 45NRTH WÖLVHAMMER from 45NRTH on Vimeo. The vision for the Wölvhammer transcended traditional cycling footwear and originated from the conceptual standpoint of a mountaineering boot. This inspiration remains in the newly redesigned Wölvhammer. 45NRTH removed the outer zipper and velcro in favor of a lace-up design with a gusseted tongue to keep wet winter weather out and warmth in. They redesigned the power strap to remove the restrictive D-ring and make it easy to grab with gloves. Rounding out the outside design, the full grain leather and ballistic nylon CORDURA® shell is extremely durable and adds some style. 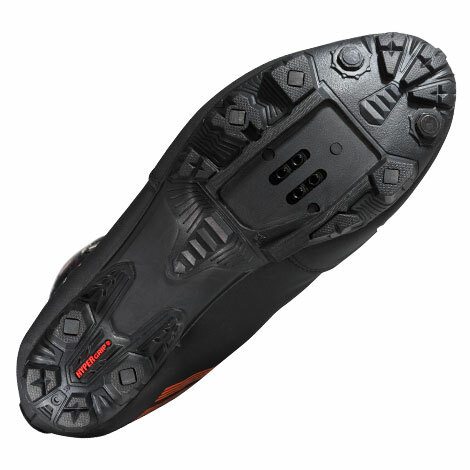 On the toe, they've added a protective rubber toe cap to help protect from impacts, abrasion and moisture. Beneath the shell, the waterproof membrane provides protection from the elements while allowing your feet to breath. The dedicated hook on the toe box pairs perfectly with the Bergraven Gaiters for when the snow gets deep. The cleat mounting area is compatible with Shimano SPD pedals, and other pedals that use a similar 2-bolt mounting system. On the inside, the insulation package is maxed out with 200-gram Primaloft ECO Gold and fleece lining to help wick moisture to keep your feet dry and comfortable. Carrying over from the previous years, the NASA approved Aerogel® insulation in the footbed blocks cold transfer from the cleats keeping your feet warm down to 0ºF. 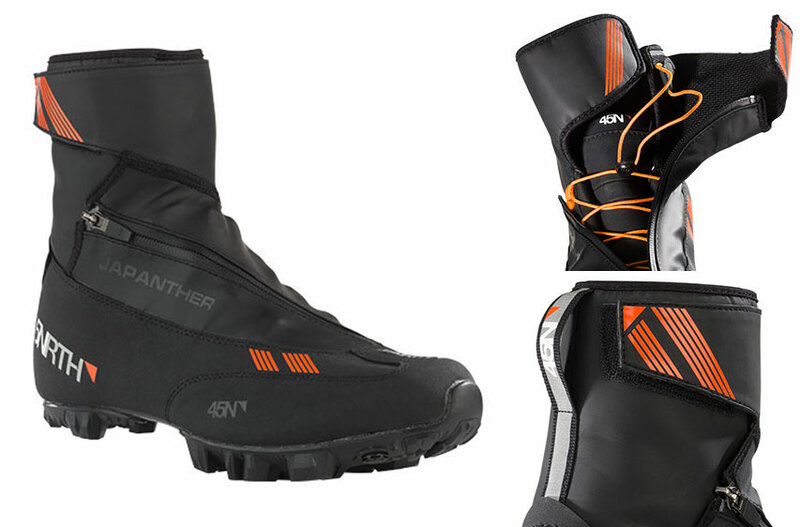 Look for the new 45NRTH Wölvhammer winter cycling boots in all three Century Cycles stores this fall! $324.99 per pair. Gentle Brook, a non-profit established in September 1974, provides residential services, day rehabilitation and vocational training, supported employment services, and programs for individuals with intellectual and developmental disabilities. They are based in Hartville, Ohio. Norm Wengerd is the Chief Exectuive Officer of Gentle Brook, and an avid cyclist. In late August, we embarked on a bicycle-touring adventure to raise funds and awareness for the Gentle Brook organization. He's riding the Great Divide Mountain Bike Route, a mostly off-road bicycle route of almost 2,700 miles from Banff, Alberta in Canada to Antelope Wells, New Mexico. Norm is riding a Salsa Cycles El Mariachi Ti mountain bike. He has nicknamed the bicycle "Mabel," after a horse he had as a young man. 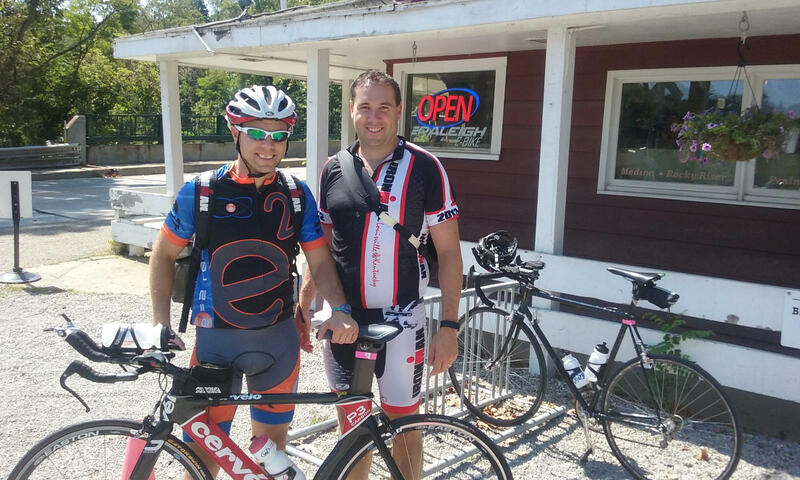 Earlier this summer, he took advantage of our Bicycle Fit Service to make sure the bike was dialed in just right for him. 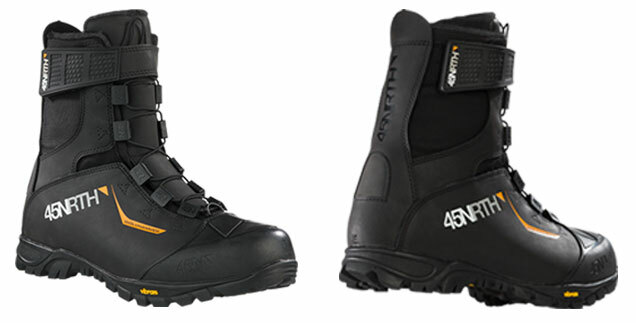 We are excited to release the first of three new or redesigned boots from 45NRTH. The Japanther is stepping in for the Fasterkatt, Japanther fills the transition season. Rated for comfort down to 25 degrees (Fahrenheit), it's perfect for those times of year when the temperatures drop pretty low, but you aren't in need of a full-on snow boot. 45NRTH JAPANTHER from 45NRTH on Vimeo. A completely redesigned upper warrants the name change and provides a better fit for a broader range of feet. Designed specifically for cool and wet conditions, Japanther provides a high level of water resistance, moisture regulation, and comfort in a performance cycling shoe. One of the first things you'll notice is the placement and direction of the zipper. By orienting the zipper flat across the top of the foot, from big toe to outside of ankle, stress is reduced, which optimizes the performance of the zipper coils. Combining that with the adjustable ankle pipe, the 2016 Japanther will fit a wider range of foot shapes and provide extra adjustability and comfort. Inside the boot, the waterproof - breathable membrane locks out cool wet weather while allowing heat vapor to escape to keep your feet dry and comfortable. The insole uses heat reflective aluminum, a waffled foam bottom, and wool felt to help retain the heat needed to stay warm on cool fall or spring days. 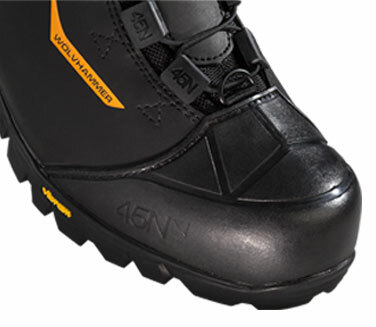 Under the foot, the sealed cleat pocket keeps water from entering through the mounting holes. On the mountain outsole, the open lug patterns sheds mud and reduces weight. Anti-slip micro-glass filament lugs placed under the toes and heel enhance grip on slick surfaces. Compatible with Shimano SPD pedals and other pedals with two-bolt cleats. Keep your feet warm and dry this fall and say goodbye to shoe covers. Look for the 45Nrth Japanther cycling shoes in all three Century Cycles stores this fall! $224.99 per pair. 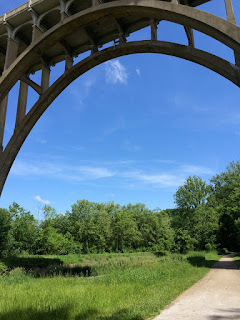 Vote for a new bridge on the Brandywine Gorge Trail! Through October 31, you can vote daily for Brandywine Gorge Trail to win a new bridge! 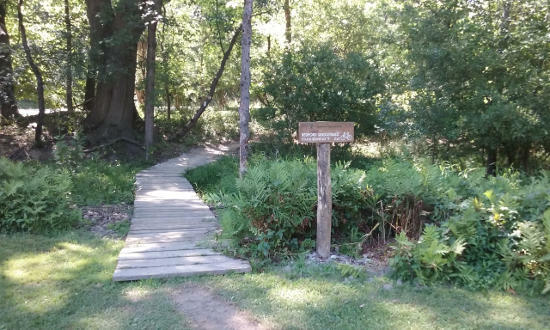 Michelob ULTRA and the American Hiking Society will give $25,000 for the two top-voted trail projects in the country—and we need YOUR votes. 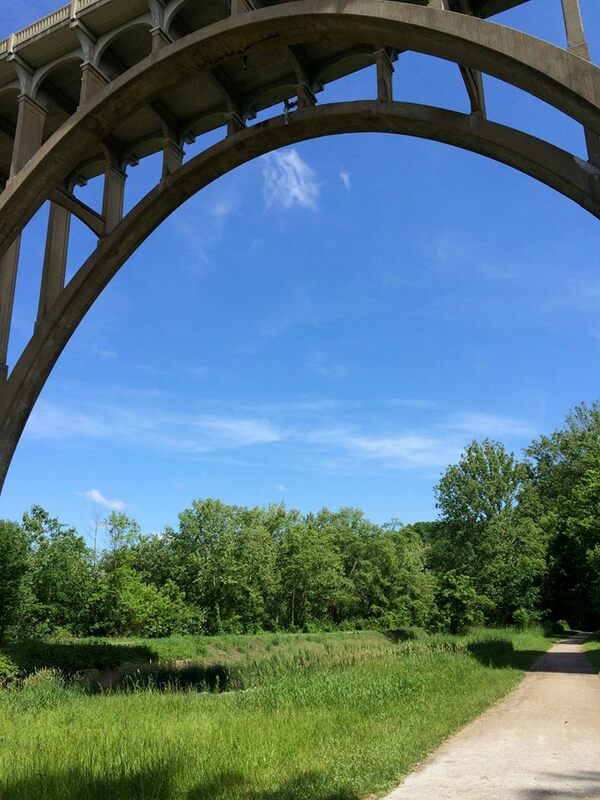 The people of northeast Ohio know how to band together for a cause—just think back to the creation of the Cuyahoga Valley National Park in 1974. Today, we need your help in voting every day for this fantastic trail project in CVNP. Make the voting page your homepage, and let’s show the world how much we love our trails! The Brandywine Gorge Trail project has been nominated for the Superior Trails grant program, sponsored by Michelob ULTRA and the American Hiking Society. Ten trail projects from around the country will compete for funding, driven by your online votes. If Brandywine Gorge Trail is one of the top two projects, CVNP will receive $25,000 to complete the new bridge in the summer of 2016. As you near the falls boardwalk, the trail crosses Brandywine Creek. A bridge across the creek was originally built in 2009, but severe flooding in June of 2014 moved a foundational pier and caused the bridge to collapse. Several temporary bridge crossings have been installed during the past year, but they are also regularly washed out during heavy storms. Today, there is no temporary crossing, cutting off the popular hiking loop from Brandywine Falls. By voting for Brandywine Gorge Trail during the Superior Trails campaign, you’ll help fund a much-needed new bridge for the park and save hikers from fording the creek. Based on soil borings of the area, the new bridge pier will be a floating slab, firmly secured with pile drivings. The design of the new pier will ensure its longevity. If the park receives funding, visitors can enjoy this essential piece of the beloved Brandywine Gorge Trail. Can we count on you to help? Make sure you bookmark the voting page to vote every day. Check out the Conservancy for Cuyahoga Valley National Park's Facebook, Twitter, and Instagram for updates and to share the campaign with your friends, too. Thanks for your support! 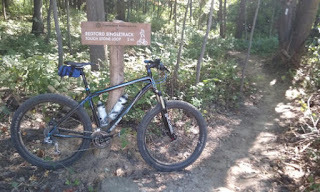 The Bedford Singletrack mountain bike trail in the Cleveland Metroparks Bedford Reservation opened in June of 2014, and has been widely enjoyed by local mountain bikers from all over Northeast Ohio. About a month ago, the new Touch Stone Loop opened, adding an extra two miles of singletrack to the network. Now, the complete loop at Bedford gives you about 12 miles of a quality mountain biking experience! I've had the opportunity to ride the new Touch Stone Loop a few times now. It starts at the intersection of Egbert Road and Overlook Lane (see trailhead photo above), also near the start of the Mars Quarry Trail. There's a few gently rolling ups and downs at the start of the Touch Stone Loop. 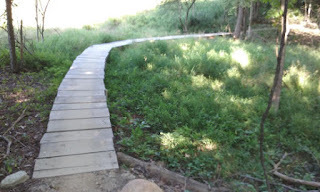 You'll go over a few new wooden bridges that were built over ecologically sensitive areas. The trail snakes through and around several natural streams and gorges, providing some stunning views. For those of you who live south of the Bedford area, this parking lot is a good starting point for the whole Bedford Singletrack system. The lot has quite a few spaces, although keep in mind there is no restroom here, nor any water fountains, like you'll find at the main trailhead near the Egbert Picnic Shelter. As you follow the Touch Stone Loop back uphill, you'll reach the intersection of Egbert Road and Overlook Lane again. Cross over the All-Purpose Trail, cross over Egbert Road, and the start of the Mars Quarry Trail will be on your left, where you can continue with the rest of the original Bedford Singletrack network. 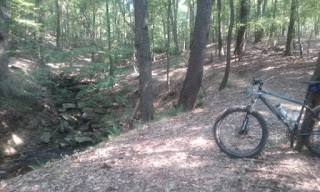 We've updated the Bedford Singletrack page on the Century Cycles web site with the new Touch Stone Loop information. Go there to find complete directions for our suggested loop for the whole Bedford Singletrack, which starts at the Egbert Picnic Shelter. 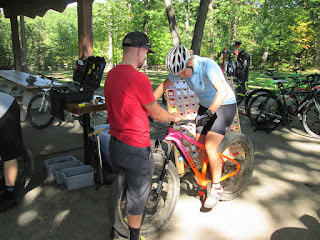 Many thanks to the staff of the Cleveland Metroparks, working with volunteers of the Cleveland Area Mountain Bike Association (CAMBA), for working to expand our mountain biking trails! 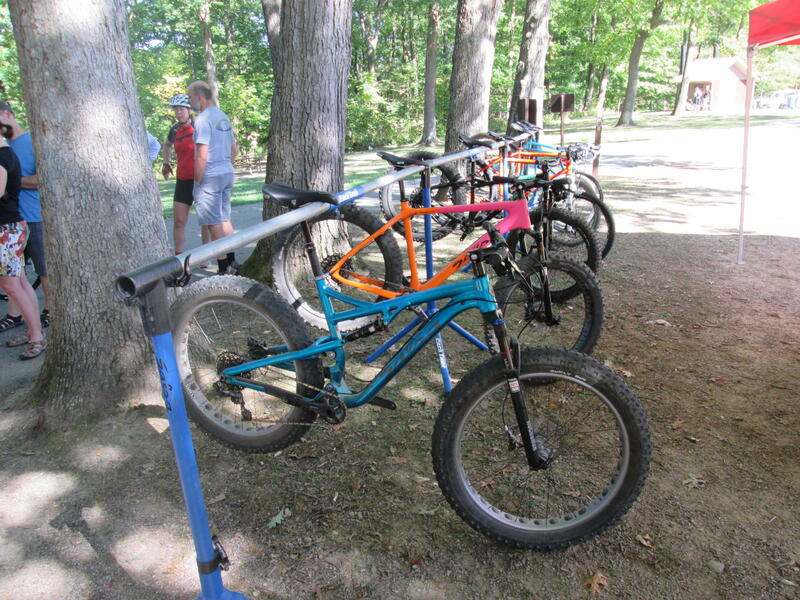 Be sure to check the trail conditions before heading out to ride the mountain bike trails. A group of dedicated volunteers checks the trails daily. You can find the latest updates with the park's new Twitter feed; follow @CMPmtb. 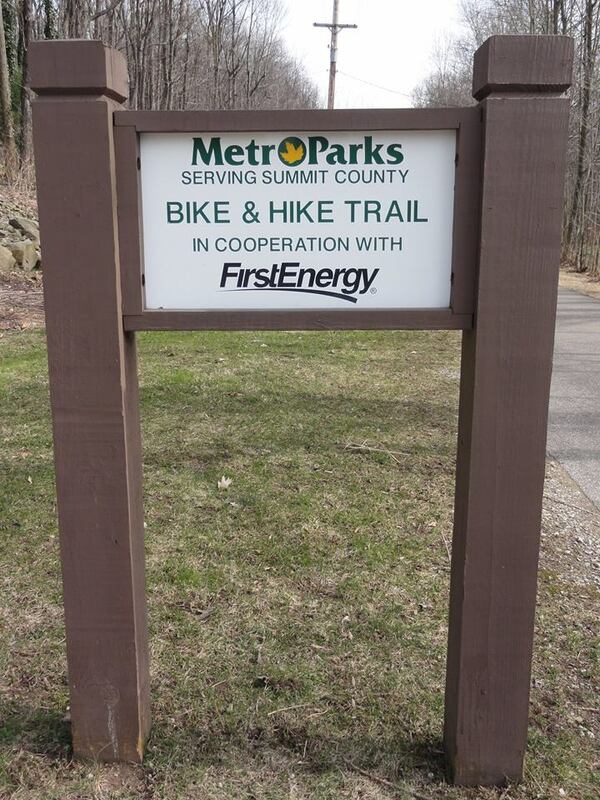 If you're not on Twitter; don't worry -- you can still go to www.clevelandmetroparks.com/MTBalerts to get the scoop. We will be upgrading our Towpath Trail bicycle rental fleet at the end of the 2015 season, so we will be making our current rental models available for sale. Used rental bikes are sold AS-IS; all sales are final. 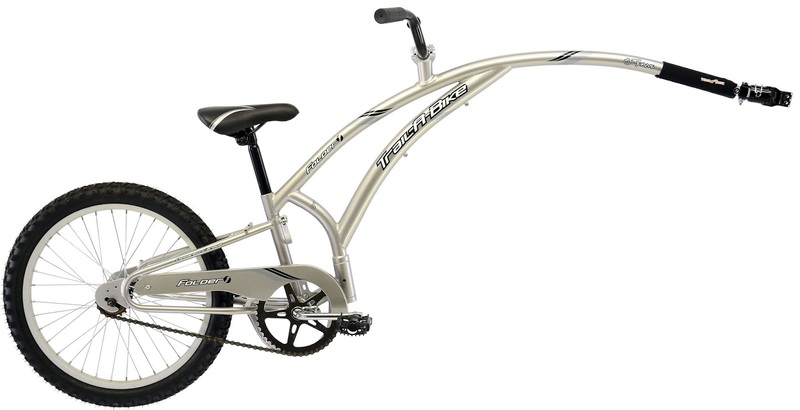 Sorry; we will NOT be selling the Electra Townie 3i rental bicycles. 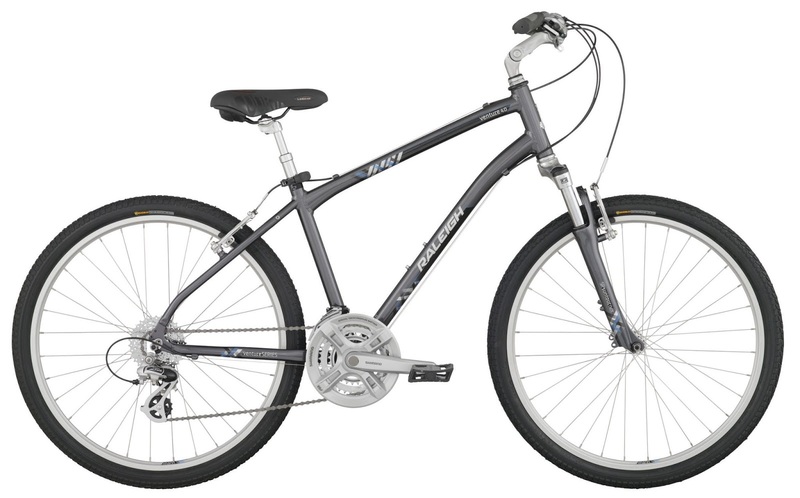 Select the specific bicycle that you want from our current rental units. Pay a non-refundable deposit of at least 50% or more towards each bike. We will continue to rent the bikes for the remainder of the 2015 season; the exact timing will be dependent on the weather. After our final rentals, we will give every bike our standard full tune-up to be sure that each bike is in good working order. We will call each customer when their bikes are ready to be picked up, most likely around early- to mid-November. 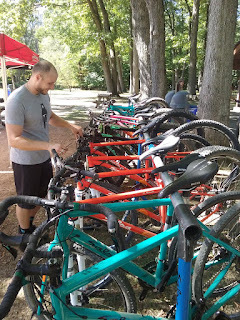 Availability of the used rental bikes is on a first-come, first served basis. Buyers must be present to select their desired model and size; no phone sales. Adventure Cyclist, the magazine of the Adventure Cycling Association, has featured a three-part story by regular contributor Chuck Haney about bicycling in different national parks in the US. Part II the series appeared in the most recent (Aug.Sept. '15) issue, featuring riding in Acadia, Big Bend, Zion, and Cuyahoga Valley National Parks. Of course, most of the focus was on the Ohio & Erie Canal Towpath Trail, but Chuck also mentioned "an abundance of fine country roads for cycling in the area." 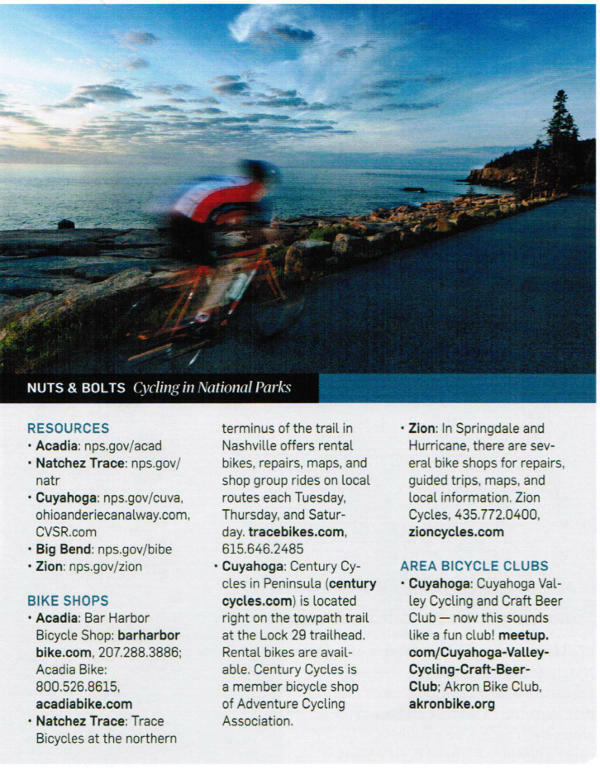 Thanks to Chuck and the ACA for mentioning the Century Cycles store in Peninsula in "Nuts & Bolts" sidebar section of the article! 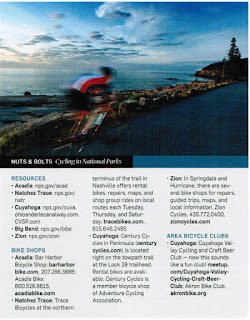 Century Cycles is a member bike shop of the Adventure Cycling Association. We are proud to be Northeast Ohio's #1 source for touring bicycles, gear, and resources. Our Medina and Peninsula stores are located on the ACA's Underground Railroad Bicycle Route, and our Rocky River store is located on the ACA's Northern Tier Route. 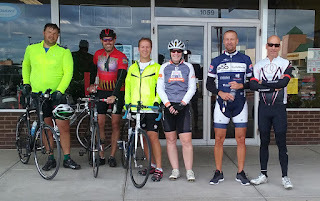 Many long-distance bicycle tourists have stopped by all three of our stores during their trips; you can see pictures of them in our Bicycle Touring Photo Gallery. 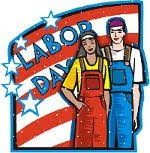 This Monday, September 7, 2015 is the Labor Day holiday. The Century Cycles stores in Medina and Rocky River stores will be CLOSED. Sorry for any inconvenience! The Peninsula store will be OPEN from 10:00am until 5:00pm. Last bike rental goes out at 3:30pm. We will be open for our regular hours on all other days. Have a great weekend!